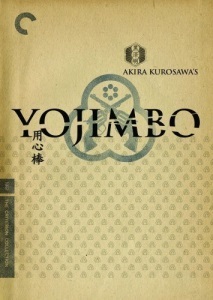 Slant: Yojimbo’s narrative symmetry seems effortless, and points to Kurosawa’s renowned Western manner of storytelling, here manifest both as a hemispherical and genre trait, but while the framework echoes, say, John Ford, the sum of Yojimbo’s iconic subversions are Kurosawa’s own. The rivaling gangs, respectively backing the town’s sake and silk merchants, are capitalist competition manifest, a thinly-veiled economic warfare metaphor that contrasts the honest brutality of Sanjuro’s mercenary prowess with the systematized, culturally-approved violence utilized by the competing gangs and corrupt townsfolk they’ve won to their cause (in a heartbreaking, yet funny moment of peripheral drama, a mother scolds her son for not committing suicide, shaming his family as a result). Sanjuro’s amoral facade suggests the difficult decisions required in a money-driven world drunk on greed, but even this antihero isn’t exempt from the occasional moment of poignant regret, such as when the innocent find themselves caught between the disparaging sides; in this manner does Yojimbo scrutinize the morality of both action and inaction. Human and yet superhuman, Sanjuro rises above the madness (literally, in one key scene that humorously foreshadows the water hole sequences of 2001: A Space Odyssey), and through his sly coercions gives hope to the notion that we can yet still put an end to the evil that men do. Empire: Kurosawa had frequently explored the notion that the world was an irredeemable place. But Yojimbo's comic detachment enabled him to despair of the villagers without judging them. What he's condemning is the capitalist impulse that causes them to stake (and lose) everything in order to gain that little bit more. It may seem ironic that a wandering warrior should abjure a life of adventure. But his advice to the farmer's son he spares at the end of the climactic slaughter — to stay at home and make the best of what you've got — is the message Kurosawa hoped to impart to restlessly rebellious Japanese youth by slipping it in under the violence they'd paid to see. Compared to latter genre outings like Shogun Assassin (1980), the bloodshed quotient may seem low. As much a thinker as a fighter, Sanjuro uses his knowledge of human nature to set the rivals against each other, thus decimating their numbers without undue risk to himself. Yet, when he does rouse himself, the ruthless efficiency of his swordsmanship ensures that the short, swift action sequences are utterly devastating. Roger Ebert: There is a moment at the end when old and new hang in the balance. The wounded Sanjuro no longer has his sword, but we have seen him practicing with a knife -- skewering a bit of paper as it flutters around a room. He faces Unosuke, the gunman. Without revealing precisely what happens between them, let me ask you to consider the moment when Unosuke aims his pistol at Sanjuro. It may be loaded, it may not be. Sanjuro cannot be absolutely sure. He is free to move away or to disarm Unosuke, but instead he sits perfectly motionless, prepared to accept whatever comes. This, it strikes me, is the act of a samurai aware that his time has passed and accepting with perfect equanimity whatever the new age has to offer. It's been way too long since I last saw this movie. Mifune is profoundly badass in this film. I was just rewatching Seven Samurai recently and appreciating how Kurosawa seems to have established some modern action movie tropes, or at least provided early instances. In terms of scenes where the main character demonstrates to the villains (and the audience) that they aren't to be trifled with, it's hard to beat the first violent street confrontation in Yojimbo. I don't even want to say what happens in case any readers haven't seen it. The first time I saw it, I was shocked. "Short, swift action sequences" indeed. I actually like Sanjuro even more. My dad showed me this movie years and years ago, and we still quote to each other "I hate pathetic people! I'll kill you if you cry!" Which is of course spoken by Our Hero to some innocent peasantfolk whose lives he just saved. Too good. Too many things to love about this film, particularly Mifune's performance, but I'll choose two wordless reactions he performs: The first is the "HolyShitDidYouSeeThat?" reaction when he sees the dog with the severed hand. The second is the "WhatTheFuck?" when he sees the giant with the cartoon mallet.